Electrodynamic tethers are thin cables made of an electricity-conducting material, typically a metal. If we deploy such a tether from a satellite in a low Earth orbit, it will tend to orientate itself vertically due to the gravity gradient explained earlier (see Momentum Exchange). It is not even really necessary to have another satellite on the other end of the tether; the tether itself has a mass and therefore experiences the same forces as the second satellite in the momentum exchange tether system example. You may remember from high school physics that when you move a conducting wire through a magnetic field, a voltage is induced along the wire. This voltage depends directly on the magnetic field strength, the velocity, and the length of the wire. Now imagine our conducting tether moving through Earth's magnetic field at about 8 km/s (5 miles/s). Such a system can induce several hundreds of volts per kilometer of tether! To make this useful, we need to have an electric current, which means we need electrons going in at one end of the tether and getting out at the other end, being driven through the wire by the voltage. You can think of a voltage as a height difference, such as between a mountaintop and a valley. Only when we add water will we get a stream flowing down the mountain (i.e., a current). Fortunately, there are plenty of free electrons available in the thin upper part of the atmosphere, called the ionosphere, where ultraviolet and x-ray radiation from the Sun knocks electrons from atmospheric gas molecules. The voltage along the tether will attract these free, negatively charged electrons at its positively charged end (called the anode). The electrons will then move through the cable to be expelled at the other end by a so-called plasma contactor (also called the cathode). The conducting tether and the less conducting ionosphere thus together form a closed electrical circuit, making the flow of electricity possible. To facilitate the collection of electrons, the anode can be a large metal sphere. However, an uninsulated tether will be able to collect free electrons over a large part of its length instead of just at its tip. It prevents the piling up of electrons in a small area, which would block the way for other electrons (since electrons have the same electric charge, they repel each other) and thus increases the tether's efficiency. This "bare tether'' concept was first proposed by Juan SanMartin, a professor of physics at the Polytechnic University of Madrid, Spain. The induced current flowing through a conductive tether will interact with Earth's magnetic field to cause what is called a Lorentz force. The laws of electromagnetism state that this force will always have a direction that opposes the motion of a wire going through a magnetic field, which means it will try to slow it down (and thus also decelerate the attached satellite). 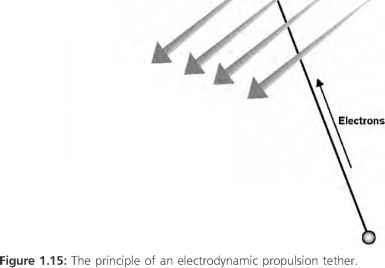 Using this "electromagnetic drag,'' we can lower the orbit of a satellite or even completely de-orbit it so that it falls back into the atmosphere to burn up or land on Earth (Fig. 1.14). Figure 1.14: The principle of an electrodynamic drag tether. spacecraft, is that the electrodynamic tether does not have to be lowered as deep into the atmosphere. propellant to generate electricity is not an efficient way to power a satellite that could use free solar energy instead (by means of solar cells). Nevertheless, electrodynamic tether power generation could be useful for generating short bursts of electrical energy, for instance when needed for high-energy but short duration experiments involving powerful "lidars" (instruments similar to radar but using laser light instead of short wavelength radio waves). Plasma Contactor = Electron Emitter electrodynamic propulsion tether. 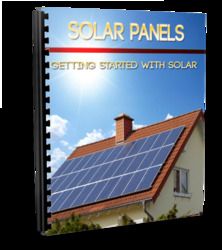 In this case electrical power supplied by a set of solar arrays is used to run a current through the tether. If the direction of the current is opposite to the direction it would flow in case of an electrodynamic drag tether, the resulting Lorentz force will also work in the other direction and thus push the spacecraft rather than slow it down. It is similar to the winding in an electric motor pushing against the magnets of its armature, causing a torque force. Such a tether can then be used to accelerate a satellite and send it into another orbit. 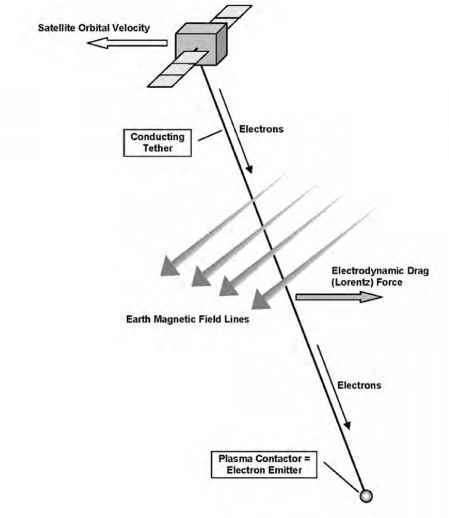 Effectively, electrical energy (from the Sun, in case solar arrays are used) is added to the tether system and converted into kinetic (movement) energy, making the spacecraft go faster (Fig. 1.15). 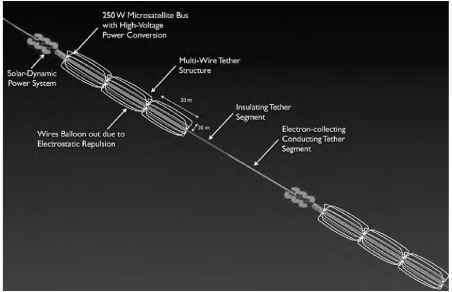 Both the "drag'' and "propulsion" variants of the electrodynamic tether can in principle replace traditional propulsion systems onboard spacecraft. They can change the orbit of a satellite without the need for any propellant, which means important mass savings. The orbit of a satellite also could be changed as many times as needed if there is no dependency on a limited amount of propellant. Furthermore, the propulsion version can be used to keep low-orbiting satellites, which are exposed to minute but continuous aerodynamic drag, at a proper altitude and thus prevent them from falling from the sky. These are potentially huge benefits, but electrodynamic tether systems only work when orbiting within a sufficiently strong magnetic field. Around the Moon, for example, they are useless because the Moon has virtually no magnetic field. Serious work on electrodynamic tethers has been going on since the 1970s, when Mario Grossi of the Harvard-Smithsonian Center for Astrophysics and Giuseppe Colombo of the University of Padua in Italy first conducted scientific research on what was then a very novel technology. Why electrodynamic tether is used instead of solar cell to deorbit satellite?